Greenpower Capital can provide all the resources and experience that are necessary to fully finance and build 10MW+ solar projects in Japan. 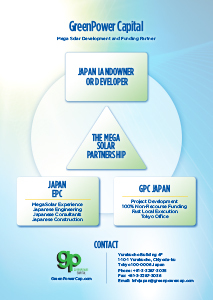 Utilizing the many years of development and funding experience of Greenpower’s principals as well as the extensive experience of their major Japanese EPC partners, Greenpower is actively developing as well as working with developers in Japan, to build an extensive pipeline of 10MW+ projects. 100% non-recourse construction financing provided (no bank financing needed). Over 1GW solar financing experience. Development capital, if needed, to get to shovel-ready status. Over 250MW of annual installed PV capacity capability currently. High-level relationships throughout the Japanese market. Full EPC experience and capability to build large-scale projects. Pre-committed multi-billion dollar take-out funds. Developers have the opportunity to get 10MW+ projects financed and built without having to worry about how to obtain construction financing or bonding to build the project. A developer can partner with Greenpower and then co-develop the project(s) to completion using our experience, funds and relationships. Greenpower can lease or purchase land from private landowners or municipalities to build our solar plants. Lease terms are for 20 years. We acquire sites from 10 HA to 200 HA. Submissions can be sent using our submission form and sent to our info@greenpowercap.com. We will respond quickly with any further information required, and provide regular status updates.